Wilmington, Delaware – Do you have a New Year’s resolution? Jeffrey J. Emmi, DDS wants patients to get off to a good start in 2015 by helping them improve their oral health. To kick off the New Year at Smile Solutions by Emmi Dental Associates, Dr. Emmi is providing patients with oral hygiene tips that will help them prevent tooth decay and gum disease. 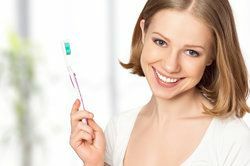 For prospective and current patients who aren't due for a check-up in the near future, Dr. Emmi is pleased to share a few of these dental hygiene tips. Below are some great at-home options to supplement the comprehensive general dentistry services available at Smile Solutions. Brushing at least twice a day is a given when it comes to oral hygiene, but the kind of toothbrush that you use is also important. Patients should use a toothbrush with soft bristles to prevent harm to the gum line and gum tissue. The toothbrush should also have a small head so that the patient can access hard-to-reach areas of the mouth. While electric brushes aren't necessary, they are definitely worth considering when a patient has limitations with his or her manual dexterity. People often neglect to floss, but it is crucial that patients floss every night so that food particles are properly removed from the spaces between the teeth. “Flossing is always important, but if you floss incorrectly, it can actually do harm to the gums rather than good,” Dr. Emmi notes. Patients should use floss gently rather than brusquely. They should work the floss in a gentle back-and-forth motion as they move from the base of the tooth at the gum line outward. Staying hydrated with water helps keep a person's mouth moist, which helps prevent dry mouth and minimizes bad breath. Drinking water can similarly remove food particles from the teeth. Sugary foods, soft drinks, and junk food make it more likely for cavities and tooth decay to occur. Rather than consuming unhealthy foods, make an effort to eat fresh fruits and vegetables and to cut down on sweets and sodas. This is good for your overall health and your smile. There's no good reason to keep using smokeless tobacco, cigarettes, or cigars. Tobacco products stain teeth, cause gum recession, and increase the risk of periodontal disease and oral cancers. Quit smoking in 2015, or better yet, just don't start. To learn more about your options for achieving enhanced dental health and wellness, it's important to contact Smile Solutions by Emmi Dental Associates. The team can answer all of your questions and address all of your concerns in full detail during a visit to the practice.